With concern over excessive crude supply and weak demand still weighing heavily on traders' minds despite solid short-term fundamentals, the cutbacks enacted by the Organization of the Petroleum Exporting Countries (OPEC) once again marginally supported oil prices Thursday - but preliminary trading on Friday suggests the commodity will incur substantial losses at week's end. Brent gained 31 cents to settle at $66.30 per barrel, while West Texas Intermediate rose 44 cents to settle at $56.66 per barrel. Jim Ritterbusch, president of Ritterbusch and Associates, said in a note, "Mounting global oil demand concerns related to slowing world economic growth remains as a latent bearish consideration that will likely provide a limiter on near term upside progress." Given the jittery tendencies of commodity traders, news that China's oil demand could peak in 2025 could create more worries - and negatively influence prices moving forward. According to Morgan Stanley analysts, China's oil consumption will peak in 2025 due to mass-adoption of electric vehicles and high-speed rail; Andy Meng said in a March 5 report, "China will no longer be the growth driver of global crude demand; we believe the refiners and petroleum stations are the largest potential losers, while the battery companies are likely to become the key winners." Morgan Stanley predicts China's electric vehicle penetration will reach 6.4 percent by the end of the decade and keep rising to 80 percent by 2040. However, the crude market could just as easily be influenced by India, whose demand for gasoline and diesel Bloomberg pointed out is growing by about 75,000 barrels per day (bpd) and 100,000 bpd respectively - the fastest pace of growth in the world. The news agency added that demand will rise enormously over the next three month due to competing political parties campaigning across India in a bid to secure votes in the upcoming national election. For the time being, however, expect the fear of weakening economies and soaring supply to continue to influence commodities trading, as evidenced by preliminary activity on Friday: both Brent and WTI fell marginally after Mario Draghi, president for ECB, said the economy was in "a period of continued weakness and pervasive uncertainty." 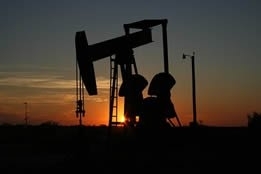 The declines were also said to have been compounded by U.S. crude exports achieving new records, reaching 3.6 million bpd in February, or more than OPEC members like the United Arab Emirates, Kuwait, or Iran produce. Our opportunities of making a difference in this part of the world are promising, says Monjasa's Morten Jacobsen.